Healthy U-Akansha : Some Facts...With A Twist! Good habits are like wine...the more older..the stronger. 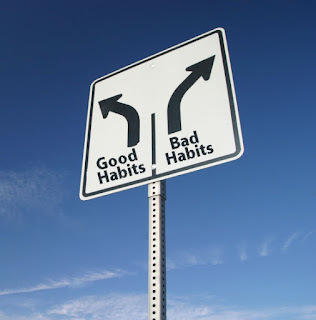 But somehow we all feel that bad habits are more addictive! Was just thinking about some habits of ours and some bitter facts behind them.Try to take them with a pinch of salt, if they hurt real bad! Here they go. People Burp....not because they don't have etiquettes! …but because they eat too fast. Gulping down food without chewing it properly does not engage saliva causing poor digestion. You take in excess air which can lead to bloating and burping, which we think is an ugly habit! Your stomach is not a dumping ground! Overeating leads to obesity, CV disease and other lifestyle diseases which we all are aware of. But overeating also leads to production of toxins in the body. Lifelong overeating can lead to excessive toxin production and accumulation which will result to colon diseases. Feed your body not your emotions! A stressful day in the office, a breakup with the loved one, or a simply bad day doesn’t give you the privilege to binge on that calorie loaded huge bar of chocolate.Binge eaters report more health issues like stress, insomnia, and not to mention drastic weight gain. When nature calls, answer before it’s too late! Not listening to natures call on time puts extra load on your system, specially your vital organs like kidney and intestines. God made doctors for a reason. Keep them employed please! Self prescription of medicines even if it’s just a crocin can be fatal at times. If you think you’ll live longer…maybe you will! Researches show that optimistic people are 14% less likely to die due to illness as compared to pessimists. Also they are 30%less likely to die of heart disease. So think again what wrong are you doing and start talking a different route to life!